Be the first to share your favorite memory, photo or story of Gerhard. This memorial page is dedicated for family, friends and future generations to celebrate the life of their loved one. The Lord in His perfect time called home his child Gerhard Schutten on Friday, March 22, 2019 at West Lincoln Memorial Hospital in his 93rd year. Beloved husband of Elizabeth Maria Schutten (nee Oosterhoff). He and his wife were blessed with eight children: Herman and Christina, Bernie and Lisa, Jayne and Robert North, John and Wendy, Ron and Carol, Marc and Margaret, Allan and Janet, predeceased by their eldest son in infancy, as well as their daughter-in-law Alison (nee Hopman). Cherished Opa of 37 grandchildren and 71 great-grandchildren. He will also be missed by his brother, brothers and sisters-in-law and many nieces and nephews. Special thank you to the doctors, nurses and caregivers at West Lincoln Memorial Hospital for the compassionate care they provided. 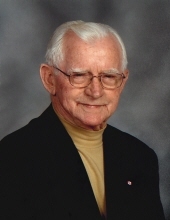 Visitation will be held on Monday from 2-4 p.m. and 7-9 p.m. at COVENANT CANADIAN REFORMED CHURCH, 480 Woolverton Road, Grimsby, where the Memorial Service will take place on Tuesday, March 26, 2019 at 11 a.m. Private Family Interment to precede the service at Chapel Hill Memorial Gardens. In lieu of flowers, donations made to the Anchor Association or Shalom Manor would be appreciated by the family. "Email Address" would like to share the life celebration of Gerhard Schutten. Click on the "link" to go to share a favorite memory or leave a condolence message for the family.